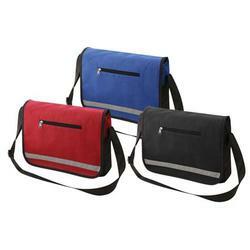 Non Woven Reflective Messenger Bag - Express Corporate - Promotional Products - Delivered Fast! Environmentally friendly, 110g non-woven, coated water resistant polypropylene Messenger Bag with long handle and reinforced stitching around all edges, handle for extra strength and relflective stripe on front flap. . Price includes a one colour print.